Welcome to Centric Design Studio. 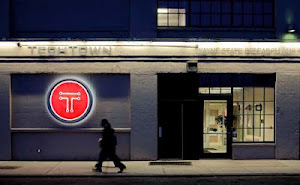 You'll find us in TechTown in Detroit, Michigan. Centric Design Studio merges architecture and graphic design practices. Our method of practice gives structure to and communicates the relationships between an organization as a whole, its individuals, as well as its products and services, all with the objective of design value. Collectively, our principals - Christopher Bruner, Saundra Little, and Damon Thomas - have over 21 years experience in Architecture and Graphic Design. We offer services for new construction, renovations and additions and specialize in providing three-dimensional modeling and visualization with state-of-the-art analysis and design tools as an integral part of the business plan. Read more about our firm's capabilities in our firm profile. Head on over to our Press page to read more about the growth and development of our firm. You'll also find us on social media - Facebook, Twitter, and LinkedIn. We're proud of the projects we have lead and partnered with other firms on: healthcare, education, community-focused, and others. We look forward to introducing you to employees and partners and sharing our projects and processes. As Saundra said, "We're just excited about everything that's going on with Detroit... that keeps us going."